According to the Global Interconnection Index (GXI) volume 2, global Interconnection Bandwidth is expected to grow at nearly 10x the volume of internet traffic by 2021, as enterprises adopt interconnection for direct, secure data exchange. This compounding growth creates an opportunity for legal services firs to build exchange points near consumers, technology partners and service providers. 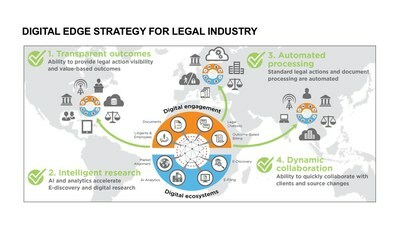 The result is a digital platform of interconnected business and technology ecosystems that integrates AI, analytics and cloud capabilities for efficient delivery of legal services.